Kabini had always been on our travel wish list for quite some time. But we could never make it there for reasons unknown! We are frequent travelers to most wildlife reserves in South India and have always wanted to try out the safari in Kabini. It all started when one of my friends sent me a link that talked about a bloggers retreat hosted by The Serai, Kabini. I filled up the application and hoped we would finally get a chance to visit Kabini. That same day we left for a trip to Shirdi and just after we had done the Darshan we got a call from them informing us that we have been invited for a wildlife retreat!!! A group of 8 bloggers including us was invited to experience 3 days of adventure, fun, and wilderness in one of the most luxurious properties situated amidst nature. The Kabini river which is also known as the Kapila or Kabani is located in Southern India. It originates in Kerela moving on towards Tamil Nadu before it finally merges with the Bay of Bengal. The backwaters of the Kabini river are very popular. They are rich in wildlife especially during the summers when the land turns lush green and it gets very accessible for animals who come there during early mornings and evenings to quench their thirst. This is also one of the best seasons for tourist to come and enjoy wildlife sightings including the spectacular congregations of Asian Elephants. The Serai, which was formerly known as Cicada Resort is a beautiful place to relax and watch various animals from the comfort of your private balcony facing the lake. It is a great place for birders as 270 species of birds are found in that region and every year thousands of migratory birds visit this place during various seasons of the year which includes the Malabar Trogon, the Malabar pied hornbills and the crested hawk-eagle. It had been a long time since we took off on a bike ride so we decided to ride this time. Luckily, since it was a Sunday the traffic was minimal and we got to enjoy a nice long ride winding through the highway and country roads to reach our destination in about 5 hours from Bangalore. On our arrival, the staff welcomed us with traditional tika followed by refreshing juice and cold towels to freshen up. Check-in was done in a jiffy and we headed to our rooms eager to see what was in store for us. There are around 20 rooms in the property, each one with a lovely waterfront view. The location of these rooms was exceptional. The view from the sit-out was stunning, the surroundings peaceful and the rooms itself tastefully decorated, keeping in mind the wildlife around the property. After a brief photo shoot, we headed to Wildgrass, their in-house restaurant. We were served an impressive array of soups, salads, desserts and main course from all over the country. There was a lot to choose from so we tasted as many delicacies as possible but our favorite that day was the Chicken Tikkas! The chefs did a spectacular job of serving a delectable buffet spread, some finger licking food consisting of vegetarian and non-vegetarian delicacies including few dishes from the local cuisine. Lunch was a lightning-quick affair since we were excited about the jungle safari that followed next. Soon, we had occupied our favorite spots on the safari bus and off we went into the magnificent jungles hoping to spot something. We curiously leaned out of the windows, our sight following every movement in the jungle but we could only manage to see hoards of deer snacking on the dry grass. A group of wild boar ran across the muddy roads, scrambling to get into the bushes and avoid been spotted by predators. As we climbed a narrow incline, the bus stopped and everybody pointed towards a black figure emerging from behind the tall trees. The figure appeared from the shadows as sunlight fell on it and for the first time I saw this gigantic male Sambar deer. 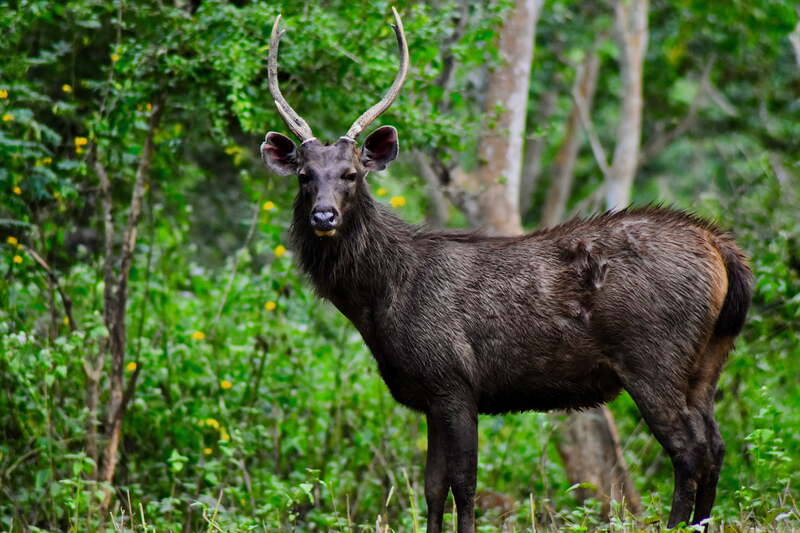 We have seen plenty of them in Bandipur but not one that’s as big and black as this one. Pretty exciting but still no sign of the cat family. We spent almost 2 hours in the jungle waiting to spot the leopards and drove to the waterside to try our luck. No cats but we experienced a magnificent sight of elephants swimming across the river; something we hadn’t seen before. It was sundown and we headed back to the resort a little disappointed and exhausted. To ease our disappointment, we all headed to Serai’s bar, The Outpost. The staff had set up a campfire right outside the bar and we soon were downing cocktails and sharing travel stories with each other. As we munched on some mouth-watering chili chicken, we got to talk to all the bloggers about their journey into their respective genres. Dinner was again served at Wildgrass, another lovely spread of local and continental cuisines. After a sumptuous meal, we headed back to our cozy rooms and soon dozed off. The day had been eventful but we had a lot more in store. Next morning, we woke up early as we wanted to take a boat cruise and try our hand at Kayaking. As the sun rose, it hit the blue hues of the Kabini river turning it into a dazzling golden shade. This was probably one of the most beautiful sights we had ever witnessed. The boat safari is also an excellent opportunity to spot wildlife along the shore of this river as it serves as a waterhole for all the animals in this wildlife reserve. Breakfast followed soon after, post which I grabbed one of the cycles and took a tour of the property. There are plenty of activities to indulge in; cycling, swimming, kayaking, boating, archery, badminton and the list goes on and on. Plenty of activities for the little ones as well. Watching others play in the swimming pool was quite fun too and it was fun shooting some slo-mo videos of them fooling around. A lot of chit chat and a lot of laughter made the experience quite a memorable one. Post lunch, we again headed to the lake for a kayaking session. All though I am terribly scared of the water, I always end up getting brainwashed into trying water sports. Hesitantly, I got into the kayak with Sachi and decided to give it a go. As we drifted away from the shore, the boat started wobbling; maybe it was Sachi playing a prank on me and I let out a loud shriek. I was later told that people could hear me screaming almost half a mile away!! We managed to be in the water for more than 30 minutes and it definitely called for a celebration. I think Sachi also needed a drink having been the victim of my screams. Sure enough, post my kayak session I was at The Outpost with a six pack in my hand, patting myself and feeling amazingly proud. Suggested Read - Did you know about the Estonian homestay in Coorg? The next day was our last at The Serai and so we decided to try out their spa, Oma. It was a very relaxing, invigorating 30 mins of foot spa session and I almost dozed off several times. Back from the spa, we packed and had lunch with the entire team. The retreat had been an adventurous, luxurious and fun experience. Meeting people from different parts of India, connecting with the wildlife at Kabini and experiencing Serai’s impressive service and friendly hospitality. We took a lot of memories with us as we bid goodbye to the beautiful place and a bunch of new friends. See more of them here!